We can only imagine lizard kisses and kitty licks make for a delightful pairing. Peak into the rainforest with us to see a delightful duo about to undertake an adventure. Between the lizard’s tiny size and the leopard’s pouncing ability, there isn’t much this delightful set of friends can’t do. If you’re ready to join in on the fun every time you enter the pool, you’ll love the Chameleon Mesh Bag. 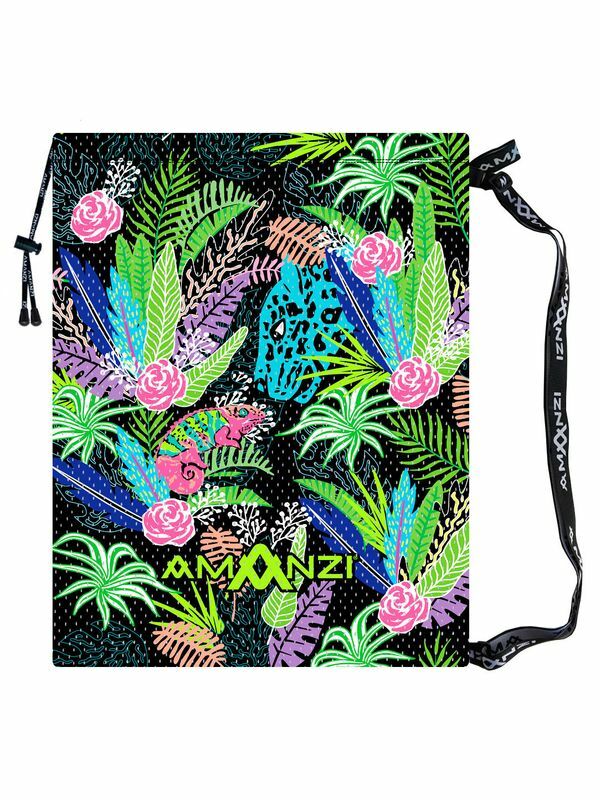 The Chameleon Mesh Bag has been designed by AMANZI Swimwear. AMANZI (a-marn-zee) meaning water in Zulu, is an Australia sports swimwear company specialising in chlorine resistant training swimwear for competitive and active swimmers. AMANZI was created to satify the needs of the fashion forward athlete with designs that are functional and highly durable. The team at AMANZI Swimwear understand that swimwear is not just something you swim in, it should also be a reflection of your unique style and personality. AMANZI puts a great deal of effort into their prints so that you can feel comfortable in your swimsuit and look great!